The main goal of RDI actions under this theme is to protect the health of European citizens through the provision of safe water. Attention is particularly paid to the impacts of i) emerging pollutants; and ii) natural hazards and water infrastructures on water and human health. Millions of Europeans receive high quality drinking water every day. However, the provision of safe water for drinking purposes is threatened by, amongst other factors, the improper disposal of chemicals, animal and human wastes, pesticides, emerging pollutants, and emerging risks from “established” pollutants, aged water supply infrastructures, sub-optimal water management, and natural hazards. 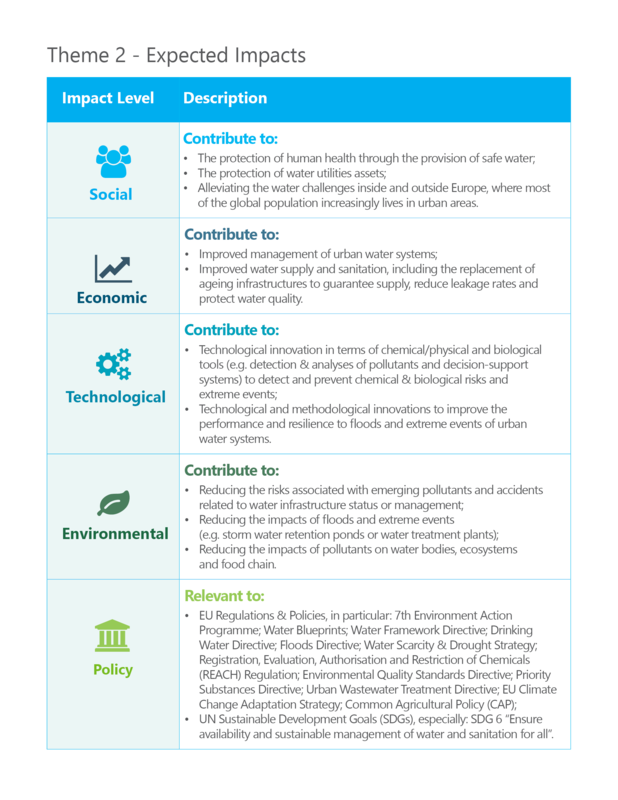 To achieve the appropriate implementation of all relevant policies and protect the health of Europeans, the Water JPI proposes that further RDI actions should be undertaken in the areas of emerging pollutants, water infrastructure and natural hazards. Key knowledge gaps remain around the environmental behaviour of emerging and “established” pollutants and their impacts on human health. Likewise, water distribution and storage facilities may be old and their performance far from optimum. Scientific and technological attention needs to be paid to innovative practices for minimising risks associated with water distribution and storage facilities. Ongoing monitoring of the seven projects funded under the 2013 Water JPI joint call. Synergies with other initiatives and opportunities for possible strategic and co-funding activities will be explored. These would include synergies with, for example, the Joint Programming Initiative on Antimicrobial Resistance (JPI AMR), which coordinates national funding and supports collaborative action to fill knowledge gaps in this field. In 2013, the Water JPI launched its first common Joint Call to enable multi-national, collaborative research, development and innovation projects addressing the topic "Emerging water contaminants - anthropogenic pollutants and pathogens". In 2016, the Water JPI held its first Networking Workshop of the 7 projects funded under its 2013 Pilot Call and other relevant EU projects. In 2017, the Water JPI held its first Knowledge Hub workshop. The first Water JPI Knowledge Hub is aimed at launching it in 2018 and will be built around the topic of “Emerging Pollutants”.